The paper reviews the approaches of adequate regressions selection for observed processes and their use for solving practical problems of interpolation, extrapolation of factor analysis. The issues of forming the predictive models for the observed processes on the base of combining the parabolic regression, autocorrelation function and harmonical weight are considered. 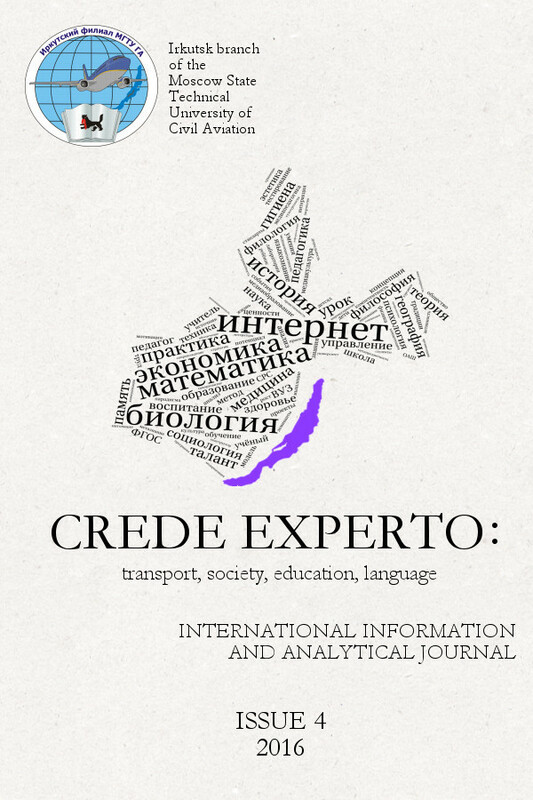 The paper reviews the author’s means of computer solutions of approximation, interpolation and extrapolation problems oriented toward educational process at engineering higher educational establishments and operating organizations of civil aviation. The paper deals with results of the performed transportation experiment and their interpretation. The aim of the transportation experiment is to find out the size of inertial forces in section of ordinary road (I. and II. class roads) in the Czech Republic with regard to cargo securing during transportation. The paper further deals with importance of knowing inertial forces for selection of fastener and way of fixation and also advantages, resp. disadvantages of using normatively set acceleration coefficients. The article carries out an analysis of the Wolfgang Borchert’s short story «The Three Dark Kings» which bears resemblance to the genre of Christmas story not only in its composition but also in motives and images used. However, the genre of Christmas story undergoes significant changes by Borchert. The demand for defining characteristic features of the Christmas story precisely and unambiguously along with the requirement of tracing the genre history in Russia and in Europe gain an impetus for new comparative and any other literature studies. Key words: Wolfgang Borchert; Trümmerliteratur; Christmas story; text analysis; motives. Novgorodov I. N., Tokmashev D. M., Gainutdinova A. F., Ishkildina L. K.
Abstract: Background. This article is about the Leipzig–Jakarta list of the Teleut language. Authors come to a conclusion that the Teleut language is more similar to the Kipchak languages according to the Leipzig–Jakarta list. Materials and Methods. Research materials are the most resistant words (the Leipzig–Jakarta list) of the Turkic languages. The most resistant words were written out of the dictionaries of the Turkic languages. In this study of Teleut, field materials of Denis Tokmashev are used. In this survey, the comparative method is used as the main method. Results. Words of the Leipzig–Jakarta list of the Teleut language in comparison with the Oghuz and Kipchak languages are revealed. Discussions. Teleut as the Altai language dialect was previously considered to belong to the Kipchak languages according to Baskakov’s conception and Siberian group of the Turkic languages that also included the Khakass, Shor, Saryg-Yughur, Yakut, Tuvinian, Altai and other languages according to Mudrak’s opinion. It should be noted that according to the Russian Federation Government Resolution the Teleut dialect was recognized as the separate Turkic language. Authors disagree with Mudrak’s statement and come to a conclusion that the Teleut language is more similar to the Kipchak languages according to the Leipzig–Jakarta list. Keywords: language, the Leipzig-Jakarta list, Teleut, Oghuz, Kipchak. *A research was prepared at North-Eastern Federal University within the framework of the project № 14-04-00346 on “The Leipzig-Jakarta list of the Turkic languages” theme supported by the Russian Humanitarian Science Foundation. The article deals with theatrical playbill as an advertising text in marketing communication. It analyzes the perception of these texts by potential viewers. Key words: theatrical playbill, communicative space, means of mass communication. Khamaeva E. A., Shishmareva T. E., Kremnyov E. V.
The article substantiates translinguographic translation as a method used in the expert translation of texts in the language written with ideographic writing system. The examples from the translations of the treatise “Shan Hai Jing” and the first ancient Chinese Dictionary “Erya” prove that translinguographic translation provides information content and authenticity of the original text in the translated text. Keywords: translinguographic translation; treatise “Shan Hai Jing”; Dictionary “Erya”; ideographic writing. Chibisova O. V., Vasilyeva A. A. The ability to avoid or solve a conflict is highly essential in modern society. In a social way, a conflict is a type of a disharmonious communication which does not exist out of the communicative situation. A conflicting communicative situation can be classified according to its direction, intention, and result. A speech conflict has a highly complicated structure: ripening, maturing, peak, decline and resolution. The last phase can result into a solved conflict and unsolved one. The analysis of three conflicting situations in the Chinese linguoculture indicted the reasons of conflicts. Knowing these reasons may be useful in cross-cultural communication of representatives of other linguocultures with the Chinese. Key words: aggressive speech, unsolved conflict, solved conflict, cooperation strategy, confrontation strategy. Ha Dong Jin, Chibisova O. V.
The article examines music and dance youth subcultures (funk and hip-hop) which were formed in the last century and which continue to exist to this day. It uses theoretical developments of scientists and materials of websites. It concludes that the main focus of the music and dance subcultures is contained in their creative and integrative potential. Keywords: youth subcultures, dance music, club dances, appearance, ideology. The article deals with the research of issues to form media competence of the secondary language personality. It describes methodology including the main approaches, pedagogical principles, methods, means, forms to form the phenomenon. Key words: methodology, media competence of the secondary language personality, competence-based approach, principle, method. The article deals with the problems of the younger generation of interaction with the modern Internet space. Analyzes the main hazards and risks associated with the presence of students in the virtual space, discusses aspects of media education, which in modern conditions is one way of familiarizing the younger generation to a full understanding of media information for the safe use of media resources. Keywords: media, media culture, media education, cyber security. The article discusses the work of film critic, director, screenwriter Oleg Kovalov. The author analyzed his articles and films, the main directions of his creative thought, especially the style and positions. The conclusion identifies the main philosophical ideas. Keywords: Kovalov, film criticism, media criticism, movies, mythology, mass consciousness, director. Contrastive analysis has a great educational potential. However it is quite difficult to use it in teaching Russian-English translation to the students of the Asian-Pacific region due to the problem of three contacting languages’ interaction (two foreign languages: Russian and English and the learners’ native languages); it’s quite problematic and painstaking to reveal all the similarities and the difficulties of the elements of these non-related languages’ systems. This article is dedicated to the usage of communicative approach in teaching Russian as a foreign language. It describes concept “communicative competence” and one of the lesson structures which satisfies the basic principles of communicative approach in teaching foreign languages. Key words: communicative approach and method, communicative competence, PPP lesson framework. An ecological approach actualizing the relationship between the appropriate culture and the idea of professional know ledge continuity the content of which is predominantly expressed by Greco-Latin terms has been presented in this article. Keywords: term, terminogenesis of medicine, terminological literacy, ecological approach. Today, intellectually and creatively developed professionals who are ready to work in a constantly changing society are highly demanded. Foreign language lessons provide a great opportunity for the education of creative students, due to the fact that they have a communicative and research focus, that provide students with the ability of self-searching and application of new knowledge, and also shape the experience of creative activity. Choosing new methods of teaching a foreign language and introducing them in their practical work, teachers should take into account their features to achieve better results. Literature analysis revealed the following conditions: individual approach to students; favorable climate in the classroom, without criticism that will be the basis for independence of students’ judgment; careful selection of educational material (especially texts) that meets students’ interests; systematic use of active methods of teaching foreign languages. Such teaching methods like creative exercises and laboratories, projects and gaming techniques, and also the use of modern information technologies can be considered as a priority in teaching foreign languages. These methods are aimed at active intellectual and creative activity, formation of skills of self-organization, as they are based on the problematic situations that students may encounter in their daily lives. Positive emotions caused by such methods of study contribute to students’ cognitive, communicative and creative activity, which in turn effectively influence the process of learning foreign languages. Keywords: foreign language; creative thinking; methods of teaching. Mindeeva S. V., Tolstyh O. D.
The article deals with contest movement to intensify the educational-cognitive activity of students. It gives historical information of contest movement, analyzes the theoretical basis of the issue. It describes the experience of the student mathematical contests in the technical university. Key words: contest, contest movement, mathematical contest, technical university. The article is devoted to one of the most important issues of modern higher education. The author shows the necessity of professional training for future teachers to work with parents, its specific character and main directions. The article is intended for university lecturers. Key words: family, family education, interaction of family and school, the specificity of professional training. 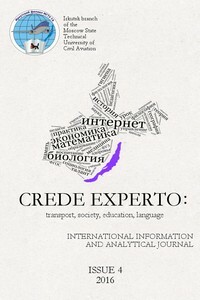 Nakonechnykh V. N., Sivkova A. V.
The article discusses the main concepts and principles of the competence approach in training bachelors in higher school. Key words: competence, education, competence approach, institute of higher education. Nikitina E. A., Korobtsov A. Y., Vereshсhakov I. E.
An important part of practical training within the professional module PM.03 “Methodological support of the training process and pedagogical guidance of a group of students in professions of workers (employees)” is organization and carrying out pedagogical monitoring. This allows to create the competencies needed in the future professional activity of training officers. In the course of many years’ training officers’ work, teachers of the Irkutsk College of Automobile Transport and Road Construction to organize teaching practice of students (specialty 44.02.06 Professional Education) ‒ a huge experience of carrying out pedagogical monitoring with the participation of trainees has been gained. In the process of implementation of the tasks of the pedagogical monitoring, they do not only provide diagnosis, evaluation and forecasting of the pedagogical process, but also they take into account the results of the organization of educational activities in the College. Presentation of the experience of the joint activities through the eyes of students will contribute to the further improvement of the pedagogical process in the field of teaching training officers. Key words: pedagogical monitoring, training officer, education, teaching, pedagogical culture, vocational training, diagnosis, assessment, forecasting, pedagogical process. Nikitina E. A.., Nadtochij S. B. The article is devoted to the issues of students’ training in specialty 23.02.03 Maintenance and repair of automobile transport within the secondary vocational education. Training of motor mechanics in the context of the SVE FSES with the use of context and dual educating technologies contributes to deep possessing professional competences, searching the ways of solving different professional problems in challenging manufacturing situations and, which is the most important, stirs interest in future occupation. Key words: motor mechanic, secondary vocational education, SVE FSES, context and dual educating technologies, possessing professional competences, professional problems, students, industrial training. This article is devoted to the description of the views of N. A. Dobrolubov, the prominent representative of the social and pedagogical movement of Russia of the second half of XIX century, on the topical problem of valued attitude to the pedagogical activity. In this regard the definitions of “valued attitude to pedagogical activity” and “social and pedagogical movement of Russia in the second half of the XIX century” are given, Dobrolubov’s opinion to the conditions necessary for forming of valued attitude to pedagogical activity is studied. Keywords: valued attitude to pedagogical activity; social and pedagogical movement of Russia; the social significance of pedagogical work; legal and financial situation; pedagogical bent; personal sense of pedagogical activity. This article focuses on the psychological characteristics of the folklore study by primary school pupils, the perception peculiarities of children’s folklore, imagination, speech development in the process of studying and reading folklore texts. Key words: primary school pupil, folklore, psychological characteristics, development of speech, perception, imagination, new knowledge, methods of performance. 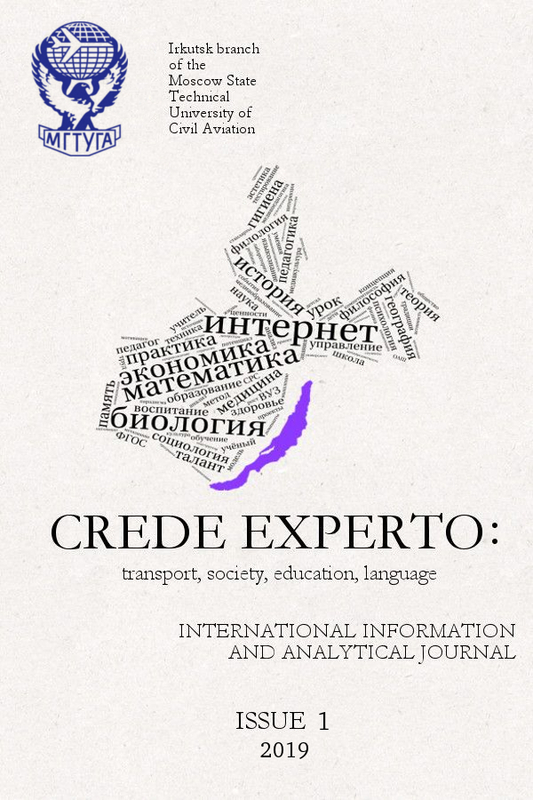 The article considers the necessary possible conditions of preserving the Buryat language in the modern sprachraum of Baikal region in the context of subordinative bilingualism. Key words: the Buryat language, sprachraum, bilingualism, subordinative bilingualism, language environment, learning content, rational methodology, vocabulary enrichment. The communication environment in the world and, in particular, in Russia, is exposed to radical restructurings: new communication channels which, in turn, change model of communication and the transmitted data characteristic arise and attract a large number of the participants, caused by the technological progress. Keywords: communication, communication channels, information, digital content, communication environment, message. The author presents an additional general enrichment sport-oriented program «A way to perfection», which has been realized for many years in Municipal Educational Institution of Supplementary Education «Dvorets tvorchestva» in Irkutsk. The program is of great interest not only from the point of view of its being a document served to theoretically justify and practically organize the work with children and adults willing to do karate but also as a complex and original research in the area of Sport Pedagogy. The program focuses not only on physical but also on spiritual perfection in children. Key words: supplementary education, educational program, additional general enrichment program, sport-oriented, karate-do, Shotokan karate-do. The article deals with the issues of social orphanhood in Russia. It gives the latest statistical data. It describes the specifics of the phenomenon for our country. It proves the necessity to organize mediative services in the centers structure of the public assistance to family and children. Keywords: social orphan hood; scheduled maintenance; social work; street children; mediation.